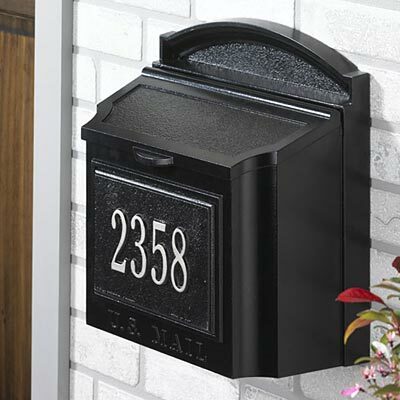 Collect your mail in a beautiful way while keeping it safe with the Whitehall Black and Silver Personalized Wall Mounted Mailbox Package. This sturdy and lovely metal box easily holds all your mail, and its tall design can accommodate catalogs, magazines, and oversized envelopes without bending them. A flip up lid enables your mail carrier to deposit your letters, and a gentle arch at the top brings curves to the rectangular piece. A locking lid beneath the flip up lid allows mail to be inserted into the slot, while preventing it from being removed without the included key. This aids in protecting your sensitive information. The textured construction and black finish add depth, while "U.S. MAIL" is stamped on the bottom to indicate the purpose of the item. Customize the box with the included front panel, containing up to five 3" characters on a single line. For more versatility, add a second line with up to eleven 1.25" characters in a striking, silver hue. The aluminum construction and black, weather resistant finish will help this receptacle last a lifetime, while the included hardware makes it easy to attach to a wall. Place the Black and Silver Personalized Wall Mounted Mailbox near your door for a stylish postal box year after year. Limited lifetime warranty.